We don't know how to begin other than to say our hearts are broken by Sunday night's tragedy. We love this city more than words can express—it is where we have chosen to raise our family, where we chose to see through the dream that was CRAFTkitchen, and where we proudly feed our community every single day. In the wake of the Route 91 Harvest Festival shooting, we want to thank our heroic first responders and give back in any way we possibly can. 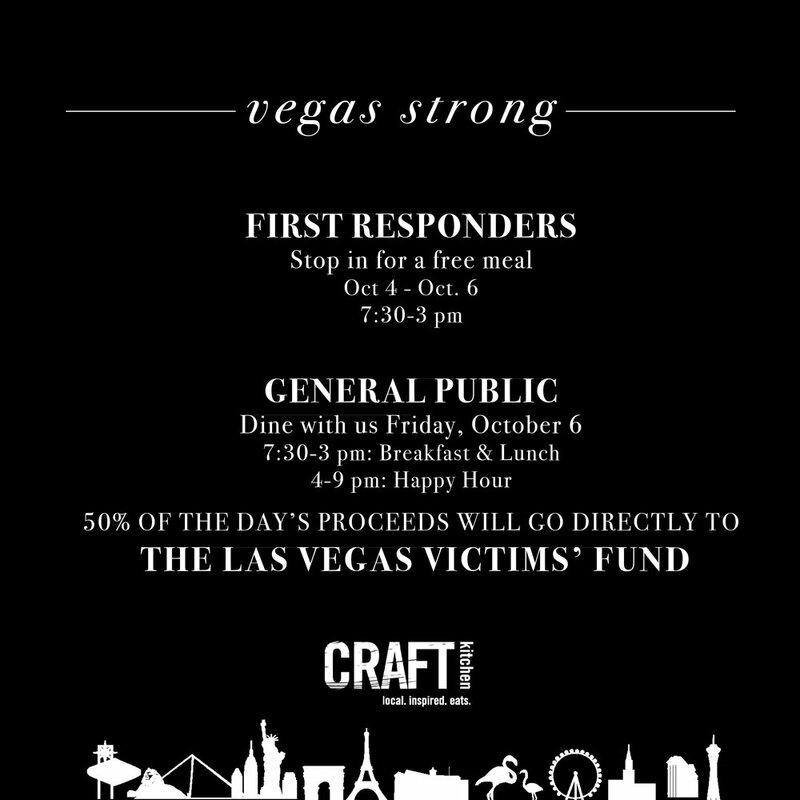 Chef Jaret invites first responders to join us Wednesday, October 4 through Friday, October 6 for a free meal. He will also spend the day Wednesday, October 4 preparing complimentary meals for the brave men and women of the Las Vegas Metropolitan Police Department as a way to thank them for the courage and strength they show every single day, including on Sunday night and in the days since. In addition, we invite you to dine with us Friday, October 6 (7:30-3 p.m. Breakfast & Lunch; 4-9 p.m. #CKFridayRecess). We will be donating 50% of proceeds earned on Friday to the Las Vegas Victims' Fund, a Go Fund Me account started by County Commissioner Steve Sisolak. Funds will go directly toward providing relief and financial support to the victims of the horrific shooting and their families. If you are unable to attend, we encourage you to donate directly to the Las Vegas Victims' Fund here. As restaurant owners and chefs, we feed people from all over this Valley, from all walks of life, every single day—and there is one thing we know to be true about this community: though it is diverse, it is cohesive. It knows how to band together. It is strong, it is thoughtful, and it is unstoppable. We are proud to call ourself Las Vegans.